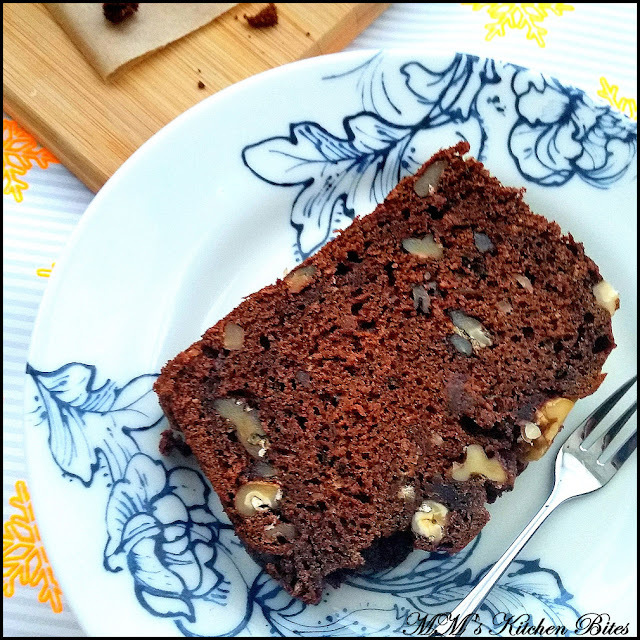 MM's Kitchen Bites: Date and Chocolate Loaf Cake...Happy New Year!! Date and Chocolate Loaf Cake...Happy New Year!! Break up the chocolate into small pieces and melt with the butter in a small bowl over a double boiler or in a microwave. Roughly chop the walnuts and reserve about 2 tbsp for topping the loaf. Whisk the egg, milk and vanilla extract in a bowl. Sift the flour, baking powder and baking soda (and salt, if using) into a bowl. Stir in the sugar, coffee and walnuts until thoroughly combined. Stir in the egg mixture into the dry ingredients, adding the dates and their soaking liquid and the chocolate mixture. Beat well and pour into the prepared tin. Level the surface and sprinkle over the reserved nuts and sugar. Bake in the centre of pre-heated oven for about 30 minutes, then loosely cover with parchment paper or foil and bake for a further 35-40 minutes or until the cake is risen and nicely browned and a skewer inserted in the centre comes out clean. Leave to cool in the tin for 10 minutes before removing cake to a wire rack. The cake can be kept, wrapped in foil or stored in an airtight container, for about 3-4 days.